QR codes have been hyped as the next step in providing customers with on-pack information and greater interaction. Well we think this is a great example of using QR codes to the best effect. This Valentine’s Day, Tussock Jumper Wines made it easy to add a personal touch to gift bottles of its wine. Using a proprietary mobile app and on-pack QR coding, the gift giver could add a digital message to specially marked bottles. The recipient then used the app to retrieve the personalized content. Click here to watch a video about sending and receiving messages with the app. ‘What I really like about this is the way it creates the ability to truly personalise a pack, with video audio and text,’ said Michael Bennett, managing director of Pelican Communications. To tag the QR code with something personal, consumers start by scanning the code with their smartphone. This sends them to the app store, where they can download the free Tussock Jumper Celebration app for either iPhone or Android. Next they open the app, tap ‘tag’ to scan the QR code again and are prompted to add their message, which the app uploads automatically. Messages can incorporate new or existing video or voice clips, music, photos, text, an email address or a phone number. To retrieve a message, the recipient opens the app, taps ‘scan’ and uses any QR reader to scan the code. The app automatically loads the message. 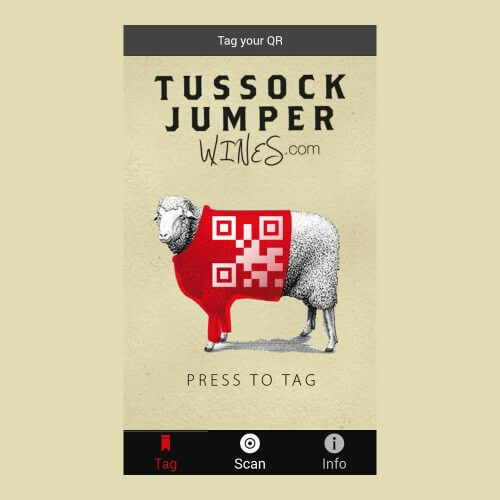 Consumers can also use the app to learn about the Tussock Jumper brand, find nearby stores that carry it and read tasting notes about its products’a range of 16 wines from 11 locations worldwide. Tussock Jumper’s QR-coded bottles will be available throughout February in select stores in New York City. The brand owner also plans to exhibit the concept at professional wine fairs in Russia and Germany this year. To stay up to date with the latest packaging news and marketing insights subscribe to the PeliVision the new Pelican YouTube channel.